Summers Of India are very hot. The day temperatures in most places are unbearable. From March to June this continues and if monsoon gets delayed it is even more difficult. But Mother Nature is so benevolent that she provides us with appropriate fruits, vegetables and other produce which helps us in surviving the seasons. Well for summers we have so many natural products to enjoy. They are healthy, nutritious and help us to stay fit and healthy. One of them is Sugarcane. It is known as "Ganna" in Hindi and "Cheruku" in Telugu. It requires, tropical or temperate climates. It originated and was cultivated in Asia and South East Asia. Later on it was introduced to Egypt, Africa and introduced in America by Columbus. India is perhaps the second largest producer of the cane. My state of Andhra Pradesh also grows this extensively as a commercial crop. It is a very popular commercial crop, as sugar, jaggery, molasses, Falernum, Rum and ethanol are produced out of it. The juice is extracted for this purpose and used. The waste or the remaining fibrous matter known as "Bagasse" is used as fire wood, in paper industry, to protect house holds plants in summer etc. 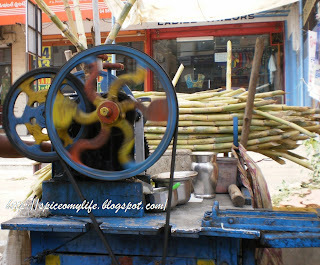 In India the Bagasse is used as fuel especially for making jaggery. We as children used to eat canes directly cut from the fields. We used to pull out the skin with our teeth, chew the inner fibrous portion thoroughly and then spit out the remaining Bagasse. Our mothers were worried that our teeth would be damaged. So they asked the canes to be cut into manageable pieces, remove the outer skin and then give to us. Actually vendors sell them from door to door in the season. 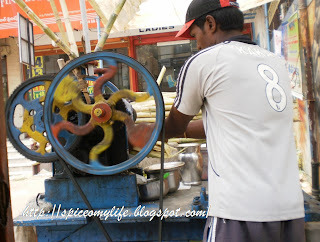 Once we choose the cane they cut them into pieces remove the outer skin, so that they can be chewed. It is a hit with children even these days. One of the most popular product derived from fresh sugar cane is its juice. It is popular through out India but more so in State.You will see one or two at each corner in each main street or busy areas. See how the canes are fed into the crushers for juice. The vendors crush the canes by passing through two rollers to extract juice and then serve. The only problem with the fresh juice here in India is that the vendors who sell this is don't keep their machines or vessels clean and also the ice used by them is not good. Because of this there are high chances of getting some infection or the other. So what I do is go early as soon as the vendors start their business in the morning, see that they clean their machinery thoroughly, take my own vessel for collecting the juice directly and few bottles to carry it back. The juice should be consumed immediately or else it gets spoiled. I store it in fridge till afternoon and then consume during the hot part of the day. But it should not be stored more than 6-7 hours even in refrigerator. Chill the juice, add ice cubes and serve. It is sweet naturally but you may add a little bit sugar if you feel so. Sometimes the juice may not be sweet enough too. In a tall glass pour the juice, half of honey and salt. Roast the Cumin seeds and Bishop's weed separately and grind each to a coarse powder separately. In a glass add the juice, honey, salt and stir it to mix them well. Add the ice cubes and sprinkle the spice powder and serve. Wash the mint leaves and save 4-5 leaves for decoration. Extract juice out of the remaining ones. If you need strain it. 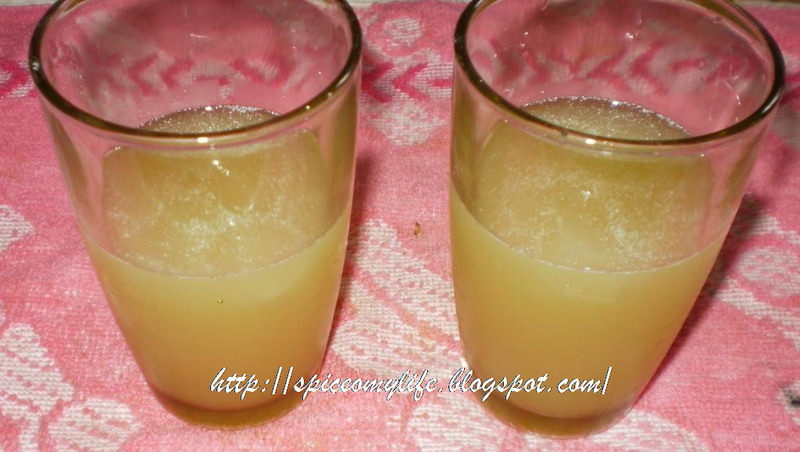 In a glass add the cane juice, lemon juice, salt, mint juice and half of the honey. Mix well. 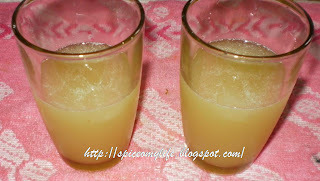 In a glass take the cane juice, lemon juice, honey and rock salt. Mix well.